Between all the amazing attractions it is offering, the stunningly beautiful beaches of cape town against a backdrop ofawesome mountain scenery are one of its biggest lures. Six of the 26 beaches around Cape Town enjoy Blue Flag status. Combine this with South Africa's glorious sunshine, great surf and warm swimming waters and you will understand why, together with all its other attractions, Cape Town was voted in the top 5 tourist destinations worldwide. The Cape Peninsula is surrounded by two oceans, the Atlantic Ocean along its western coastline and the Indian Ocean along its eastern coast line. the two of them join each other at Cape Point and its longitude. 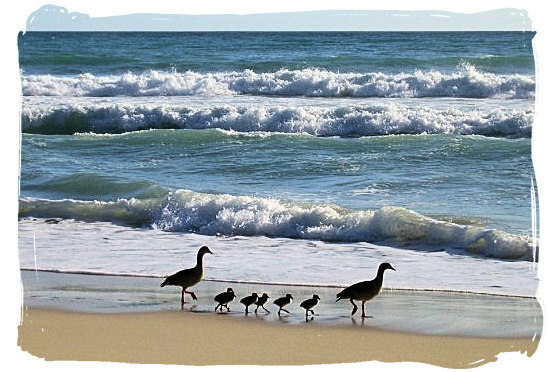 Different oceans, different water temperatures and often different weather conditions, mean two different types of beaches. The water temperatures on the Indian Ocean side are generally three to four degrees Celsius warmer than those on the Atlantic Ocean side. The warmer water of the Indian Ocean with its more calm and shallow seas on the eastern side of the Peninsula is better suited for swimming, making the beaches on that side ideal for families with children. They are popular with the local people. Nearly all of them are manned by lifesavers. Combined with shallow waters continuing a long way out it means that swimming and paddling should be reasonably safe. 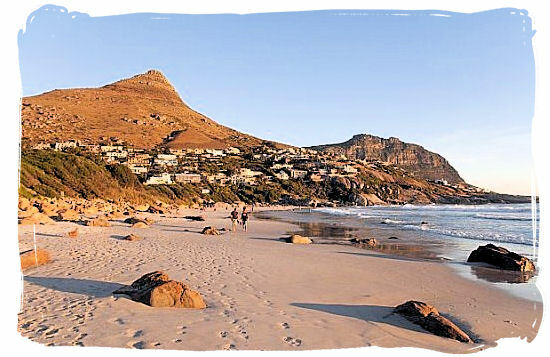 The more popular beaches here are Strand, St. James, Muizenberg, Fishhoek, Simon's Town and Boulders. On the western Atlantic Ocean side, the beaches are more trendy and lined with the most beautiful mountain scenery. It's also the side of the Peninsula where you will find great hotels and holiday accommodation, vibrant restaurants and bars and the best spots for water sports. This is where the trendy and fashionable go to see and be seen. 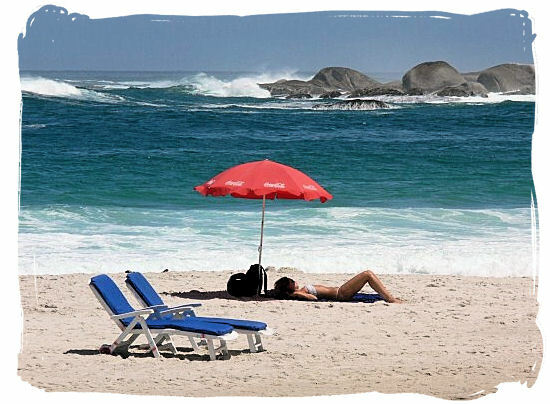 Blouberg, Clifton, Camps Bay, Llandudno, Kommetjie and Noordhoek are some of the more popular beaches on this side of the Peninsula. 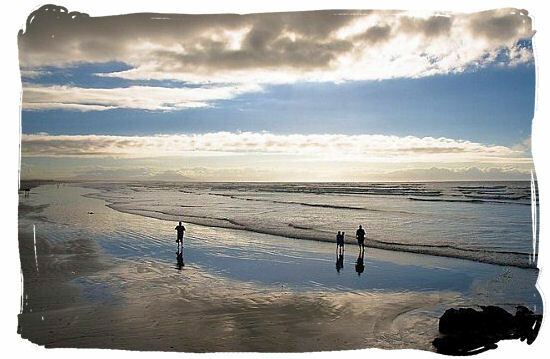 The Blue Flag status that has been awarded to six of the beaches in the Cape Peninsula region means that these beaches are meeting the Blue Flag standards for clean beaches, outstanding life saving capabilities, sound environmental control, adherence to international safety and provision of top rate parking and ablution facilities, to name but the most important ones. Lazy summer days on one of cape Town's beaches, getting your fill of the sun, enjoying stunning scenery, sipping cocktails at one of the beachfront cafes, watching the beautiful African sunset over the clear ocean water. The formula for ultimate relaxation and recreation. 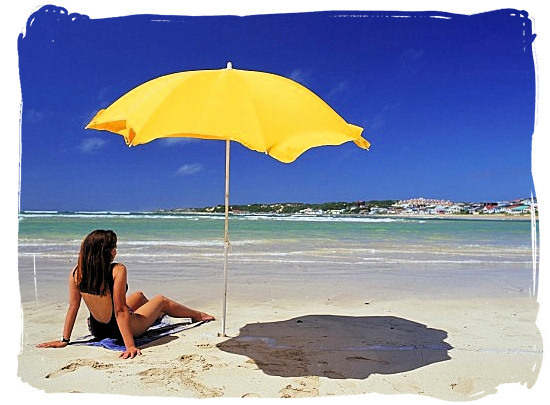 Be careful however, when temperatures soar, the Cape sun can become blazingly hot, particularly between 12h00 and 14h00 so put on a good amount of sun screen lotion and make certain to reapply during the course of the day, especially if you are swimming.